Nicola Griffith (/ˈnɪkələ ˈɡrɪfɪð/; born 30 September 1960 in Yorkshire, England) is a British-American novelist, essayist, and teacher. Griffith has won the Washington State Book Award, Nebula Award, James Tiptree, Jr. Award, World Fantasy Award and six Lambda Literary Awards. Griffith was born in Leeds, UK, to Margaret Mary and Eric Percival Griffith. Her parents—whom she describes in her 2007 memoir, And Now We Are Going to Have a Party, as wanting "to belong to the middle of the middle class … to fit in"  :7—reared Griffith and her four sisters in the Catholic faith. Her earliest surviving literary efforts include an illustrated booklet she was encouraged to create to prevent her from making trouble among her fellow nursery school students. :17 At age eleven she won a BBC student poetry prize and read aloud her winning work for radio broadcast. When Griffith was fifteen, she recognised her love for a female friend, Una Fitzgerald. :16 Once the two girls were of age, they started a romance. After almost two years, they realised their differences, and Fitzgerald left Griffith. Griffith got to know "feminists and intellectuals … bikers and drug dealers, and dykes pimping out their girlfriends." She found her first women's community there, and she read "earnest feminist fiction" as part of her regular use of Hull's central library. After the 1981 founding of the band Janes Plane, Griffith began to write her own words as its lead singer and lyricist. The group, a five-woman ensemble, played its first gig at an International Women's Day celebration in 1982. :46–58 Janes Plane achieved some local notoriety and performed in several North England cities and on national TV. Griffith was diagnosed with multiple sclerosis in March 1993. She lives with her wife, author Kelley Eskridge, in Seattle. 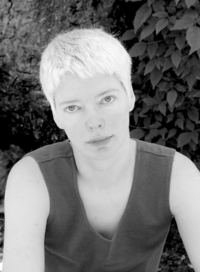 Nicola Griffith published her first novel Ammonite in 1993. It won both the James Tiptree, Jr. Award and the Lambda Award, and was short-listed for the Arthur C. Clarke Award, BSFA Award, and Locus Award. Her second novel, Slow River (1994), won the Nebula Award, for best novel and another Lambda. Together with Stephen Pagel, Griffith has edited a series of three anthologies, Bending the Landscape: Fantasy (1997), Bending the Landscape: Science Fiction (1998) and Bending the Landscape: Horror (2001). The Blue Place (1998), Stay (2002), and Always (2007) are linked novels about the character Aud Torvingen. Griffith's collection of stories, With Her Body (2004), comprises three short works. Her lone book of nonfiction, And Now We Are Going to Have a Party: Liner Notes to a Writer's Early Life (2007), won the Lambda Literary Award in the Women's Memoir/Biography category. It is a multimedia memoir, a "do-it-yourself Nicola Griffith home assembly kit." Griffith's novel Hild was published in November 2013 by Farrar, Straus and Giroux. It is set in seventh-century England. She was awarded the Jim Duggins Outstanding Mid-Career Novelists' Prize from the Lambda Literary Foundation in 2013. Holland, Cecelia (December 2013). "Locus Looks at Books : Divers Hands". Locus (635): 22. Review of Hild. ^ a b Nicola Griffith at Hugo House Part 2, video. Retrieved 11 March 2014. ^ "The Makers of Britain" by Nicola Griffith. Retrieved 1 April 2014. ^ a b Interview from HOLLAND SF Archived 15 May 2008 at the Wayback Machine by Ruud van de Kruisweg, 1994. Copy archived at nicolagriffith.com. ^ Nan A. Talese interview Archived 13 May 2013 at the Wayback Machine, 2002. Copy archived at nicolagriffith.com. Retrieved 1 April 2014. ^ Reply to Holly Archived 18 November 2006 at the Wayback Machine , "Ask Nicola". "Carol Taylor on percussion"
^ "Ammonite and Janes Plane". Retrieved 1 April 2014. ^ "Tetris + Ecstasy = no PTSD", "Ask Nicola"
^ "Outstanding Mid-Career Novelist and Emerging Writer Winners Announced". Lambda Literary Foundation, 24 April 2013. This page was last edited on 10 February 2019, at 21:29 (UTC).